KUALA LUMPUR, Malaysia, August 25, 2014 (ENS) – In October, the Royal Malaysian Police will begin using hybrid patrol cars and electric motorcycles, not only for their headquarters at Bukit Aman, Kuala Lumpur, but throughout the country. The shift is expected to save up to 35 percent on gasoline costs. Bukit Aman Logistics Department Director Datuk Zulkifli Abdullah said 2,000 hybrid patrol cars and 30 electric motorcycles will be distributed nationwide for police transportation. “The use of hybrid engines is expected to save up to 35 percent in petrol cost and reduce carbon emission by up to 30 percent,” he told reporters after attending an environmental program Saturday in Hulu Langat, a district located between the cities of Kuala Lumpur and Putrajaya in the southeast corridor of the Klang Valley. The three-day MYHijau Youth Camp program, attended by 75 secondary school students from police families and police cadets, was aimed at educating them about the need to protect the environment by reducing the carbon footprint of the police force. He said the police are discussing budget allocations for the new green fleet with the Energy, Green Technology and Water Ministry and Treasury, reports the Malaysian Star newspaper’s online edition. Zulkifli said the electric motorcycles will raise community awareness about being environmentally friendly. “We have been very much involved in green initiatives since 2012. We are looking to have about 30 to 40 electric motorcycles latest by October. The initial investment of a green initiative will always be high but we should calculate the savings these assets would bring,” he told reporters. The Royal Malaysia Police handles responsibilities ranging from traffic control to intelligence gathering to fighting major crimes such as murder and terrorism. 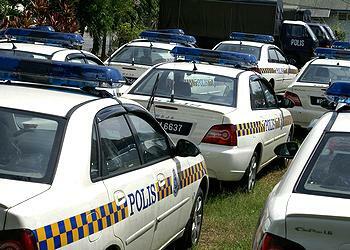 The police already use some Honda Civic Hybrids at their Bukit Aman headquarters. The hybrid Civic is estimated to be 40 percent more fuel efficient than its non-hybrid counterpart. Other automotive brands currently in the RMP fleet include: Mitsubishi, Proton, Kia, Volvo, Nissan, Ford, Perodua, Alfa Romeo, Daihatsu, Toyota and Isuzu as well as Mercedez Benz trucks and Kawasaki motorcycles. Zulkifli said tests are being done on a bolt-on after-market hybrid system called Revolo installed in one of the police Proton Inspira patrol cars. If approved, more police patrol cars would be outfitted with Revolo hybrid systems. Manufactured in India, Revolo is marketed by DFRAN Technologies. Pre-compliance tests conducted at the Automotive Research Association of India in Pune showed that the Revolo technology provides fuel efficiency improvements by over 40 percent and reduction in greenhouse gas emissions by over 30 percent.